Dracaena Massangeana – Slowly Dying? 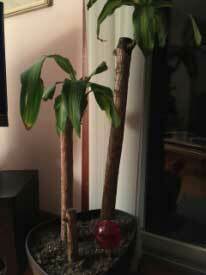 Dracaena Massangeana - Slowly Dying? I got this Dracaena Massangeana around June for a reduced price at IKEA, and stupidly left it in the car for a whole day, in a hot NY summer day. During the days that followed the 2 heads of the small cane rotted and wilted, and so did the left heads of the two other canes, leaving a right head on the large and the medium cane. I repotted it in a mix of potting soil, compost, perlite and peat moss in a pot about 18″ big, and set it indoors, in front of a sliding door facing east. Since I noticed no change for the better after 6 months of being indoors I decided to check on the roots. At this point all 3 canes are separated (not connected by one root balls) and the roots are pretty short and scraggly (tho not rotten or black). Since the plant is in our secondary home it will be watered every 7-10 days, but sometimes we don’t make it to the house for 3 weeks and it doesn’t get watered. I know there is something I can do to promote the healing of this plant, but not sure what it is. Your plant has been pretty seriously compromised and recovery will not be easy and may not be possible at all. The initial damage was caused by the extreme heat that not only damaged the leaf tissue, but also “cooked” many of the roots. It is the root damage that is of primary concern and relevancy to your plant’s future. The soil and pot size were not the cause of the problem and I would not have recommended the repotting that you did. That repotting further traumatized the roots and the very large pot makes proper watering very difficult to gauge. That is because all of the excess soil that the roots do not need tends to retain water for a long time and may cause root rot. Your lack of availability to monitor the watering makes recovery more difficult. One option would be to move the canes into a much smaller pot – one that is just barely large enough to accommodate the root systems of each cane placed close together in the small pot along with just enough potting mix to cover he roots. That pot would be no larger than 10″ in diameter and must have a drain hole. When repotting be very careful to handle and damage the roots as little as possible. If the smallest cane has no roots, then discard it as it cannot be saved. Once repotted, water it thoroughly and allow the top third of the soil to dry before watering again. When properly potted, it will take 2-4 weeks for that drying out to occur. Remove the water globe as that will keep the soil too moist. The other option is to leave the canes potted as they now are. Remove the water globe. Allow the top third of the soil to dry out before watering slowly around the base of each cane. The trick is to add just enough water so that the soil is dry again a third of the way deep into the pot whenever you return to water again. You will have to experiment to determine just what the right volume of water is each time you water. Make sure that temps do not fall below 55 degrees F. as this is a tropical plant that does not tolerate cold, especially when it is trying to recover. Fertilizer-plant food is not medicine and is intended only for healthy plants so do not use it with your plant. Unfortunately, there are no shortcuts are easy solutions for your plant’s recovery. At best, it will require a great deal of patience on your part and may not ultimately survive. A final note: if the bark on the lower portions of any of the canes start to feel dry and papery when squeezed, you can safely assume the roots on that cane are dead and it will never recover.